The Sperm Atlas displays morphology information for sperm cells collected from animals at the San Diego Zoo and other organizations. The database was created by the Reproductive Physiology Division of the San Diego Zoo Institute for Conservation Research. 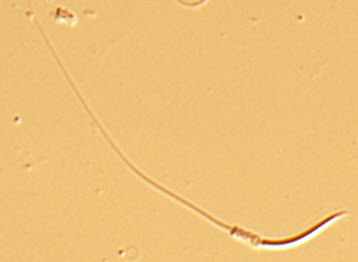 Desert tortoise (Gopherus agassizii) sperm. Credit: San Diego Zoo Institute for Conservation Research. All rights reserved. The Sperm Atlas is a sperm morphology database created and maintained by our Reproductive Sciences team at the San Diego Zoo Institute for Conservation Research. It highlights a portion of the sperm cells collected from animals at the San Diego Zoo and other organizations. This access portal to the main Sperm Atlas is maintained by the San Diego Zoo Global Library. Use the links in the boxes to the right to view/download individual species records.To view records by taxonomic category, select one of the page tabs above. Or download the complete Sperm Atlas PDF [18MB]. In 2013, a collaboration was formed between our team and Dr. Michael Berns at the Beckman Laser Institute, University of California Irvine, and the Department of Bioengineering/Institute for Engineering in Medicine, University of California, San Diego, to improve the Sperm Atlas images. Scanning electron photomicro-graphs produced by Dr. Berns and Lih-Huei Law provide a three-dimensional view of sperm cells. The SEM images illustrate cellular structures in great detail and can aid researchers in understanding the role of unique morphological features in the processes of motility and fertilization. In February of 2009, the San Diego Zoo Institute for Conservation Research's Reproductive Sciences team decided to create a database to display the diversity of sperm morphology in the animal kingdom. The task was given to ICR's first High Tech High intern, Michelle Doyle. Using our historical slide inventory, including sperm morphology slides dating back to 1980, Michelle created a database that one day would be available to the public. We call this database the Sperm Atlas. Michael Figlioli, an intern from High Tech High North County, took over the project in 2010. Together they created a database that highlights a portion of the sperm cells collected by the Reproductive Sciences team over four decades. The cells come from animals at the San Diego Zoo and other organizations. Many are representative samples from sperm that is now frozen and stored in the San Diego Zoo’s Frozen Zoo©. We continue to make additions to this atlas as more samples are processed. The measurements are often averages from many measurements taken from several specimens. This student project came out of a realization that no other online, free access, animal sperm atlas existed thus far. The Reproductive Science team had a treasure they wanted to share with other researchers, teachers, students, and anyone excited by biology and the wonders of nature.